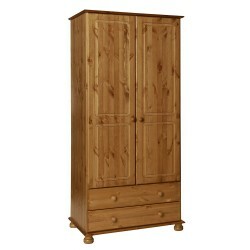 MDF Wardrobes There are 277 products. 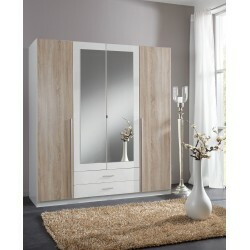 Matt White and Modern Oak Effect Wardrobe 1 Mirrored Door 2 Drawers Flat Packed Height 198cm, Width 135cm, Depth 58cm. 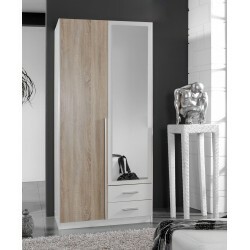 Matt White and Modern Oak Effect Wardrobe 1 Mirrored Door and 1 Oak Effect door 2 Drawers Flat Packed Height 198cm, Width 90cm, Depth 58cm. Black Ash Effect Comes with 1 mirrored door and 1 Black Ash Door Shelves and Hanging Rail Included Flat Packed Size W185cm, Height 214cm, Depth 60cm. 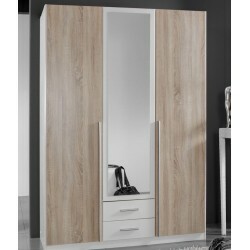 The Acton 1 door wardrobe with drawers, is a perfect storage solution for small spaces; or you can attach this to our other Acton wardrobes easily with it's pre-drilled carcass White door and drawer fronts on a White carcass.